One month ago I signed up for a 68 mile race called the Coyote Backbone which takes place in California in Mid-March. In planning out my year, one of my goals was to work around the NEW Mountain Running Camps I am coaching and organizing under my business PACE Sports Fitness. I wanted a goal that would be challenging, new and fun to help motivate my running over the winter. A week after I signed up, my friend Carrie also signed up which made it an official girls run holiday and get away. We were pumped! Well, minus the fact that we needed to get our butts busy during the cold, grey winter months, but we were committed and training had officially started. Then our plans changed. A NEW seed was planted and started to grow. 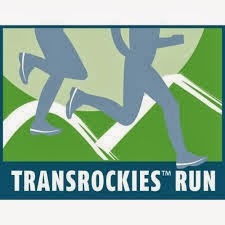 The next thing you know we were registered to participate in the TransRockies Run. A 6 day stage race in Colorado. I have considered running this race the past few years, however my heart and mind-set was always more interested in the Gore-Tex Transalpine Run. I was hooked after my first year in 2011. My sponsors True Outdoors, Western Financial Group and Salomon have all made it possible for me and I am SO grateful for them. I hope others from PACE and within our community with join us. It will be great to share the training journey and build memories at the event. There are lots of categories to choose from. You can do 3 days or 6 days. Solo or in a team. (women, men or mixed) So a fit for everyone. Let's get planning and then get training!!! If there is anyone else interested, I have a code you can use to redeem $100 off per person on any of the event options. Just email me for the code or RSVP for the TransRockies info night I am co-hosting with Kevin McDonald, of TRR, on Thursday, December 12th at True Outdoors. Kevin is giving away a free RUN 3 entry worth $900! The PACE Mountain Running Camps will be ideal training grounds to help prepare for an event like TransRockies too. Check them out and make the mountains your playground next year!